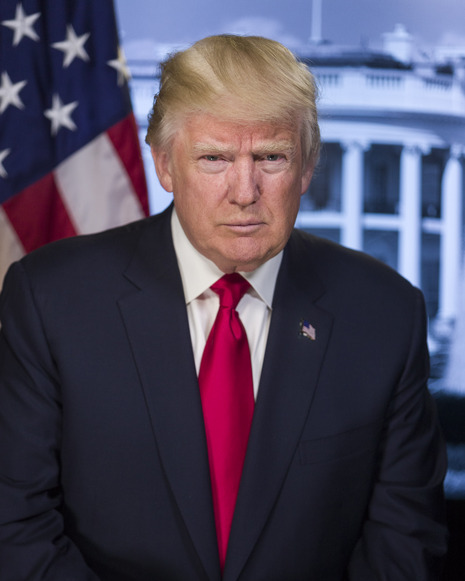 The inauguration of Donald Trump as the 45th President of the United States marked commencement of the four-year term of Donald Trump as President and Mike Pence as Vice President. An estimated 160,000 people attended the public ceremony held on Friday, January 20, 2017 on the West Front of the United States Capitol Building in Washington, D.C. Along with being the oldest and wealthiest person inaugurated as president, he is the first without prior military or governmental service experience to hold the office. The event was the 58th presidential inauguration. The official theme of the event was "Uniquely American". Held in Washington, D.C. from January 17 to 21, 2017, inaugural events included concerts, the swearing-in ceremony, a Congressional luncheon, parade, inaugural balls, and the interfaith inaugural prayer service. Administered by Chief Justice of the United States John Roberts, the presidential oath was taken by Trump as his first task after becoming president at noon, in keeping with Article Two, Section 1, Clause 8 and the 20th Amendment to the U.S. Constitution, with the vice presidential oath of office taken by Pence and administered by Associate Justice Clarence Thomas immediately preceding it. 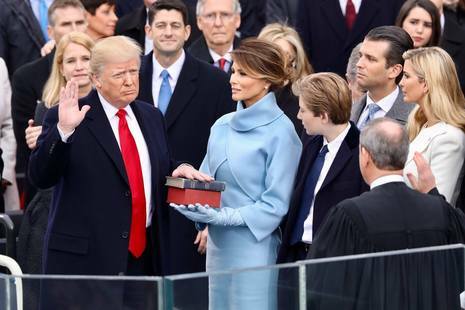 Trump was sworn in with his left hand on the Lincoln Bible and on his family's Bible. The inauguration was accompanied by protests in the United States and other countries.